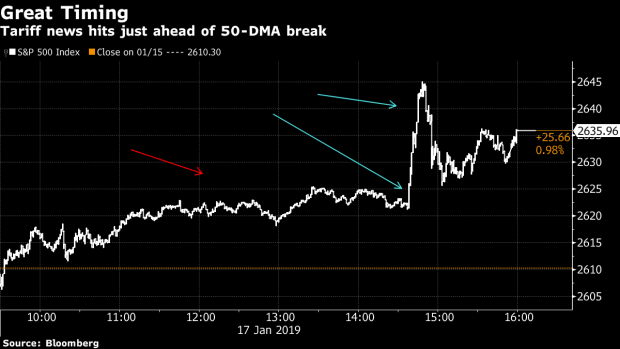 (Bloomberg) -- The setup today will be telling after a pair of investor favorites dropped bombshells that could reverberate through their respective sectors. Netflix and Tesla are sure to get the most attention (with the latter just within the last hour or so producing a soft pre-announcement via company blog) as they do most days even in the absence of tangible developments. And from the early going, the former seems to be benefiting from the overall market tone to the upside. Tesla’s surprise announcement -- mainly that they are cutting 7% of their headcount (Musk was quick to describe how their headcount had recently grown 30%) and expecting a lower GAAP profit for 4Q than 3Q (backed by Street ests. that also expected a decline) -- is souring shares early, down nearly 8%. In any other day, the earlier commentary from Morgan Stanley’s Jonas on Tesla (expecting the EV maker’s dominance of the EV market to continue to rise), may have provided the slight boost. But futures are still up (just 12 handles at last glance), even with the twin drags on the market. The latest EPFR data as cited by BofAml, also called the current positioning "bearish", with equity investors pulling $4.8 billion from equity funds in the week ending Jan. 16. The yearning for anything -- anything to latch on to buy equities was palpable Thursday, as evidenced by the lurch midday by a curiously timed (and what can only be described as an epic trial balloon) report that the U.S. was considering rolling back tariffs on China. We’ve discussed "fomo" in this column before (as recently as last Friday), and it appeared Thursday was no different. Caution was immediately thrown to the wind. No more tariffs?! Why not? (it feels like a movie we’ve seen before). Within seconds (ok a couple minutes) the U.S. Treasury denied such a program was in the works and neither Mnuchin nor Trade Rep. Lighthizer had made any tariff recommendations. Sure, we were already up on the day, no thanks to the "housekeeping" (read: kitchen sinking) results from one of the largest investment banks on the planet. They even needed to extend their conference call (kudos to management) to fully explain what went wrong after its competitor just the day before blew away expectations. But back to that timing. After spending much of the day within a few points of the 50-DMA (discussed in Thursday’s Taking Stock) amid what could only be described as anemic volumes, the report surfaced, if by fate to end the equity benchmark’s near 3-month struggle below said technical level. You can question the sanctity of that technical break given the details of the report and prompt denial, but the market had plenty of time to digest it and closed 10 handles above the 50- DMA. It did this with solid breadth and a bullish tilt -- more than 6 advancers to every 1 decliner in the S&P and defensives lagging. Trade proxies like Boeing, UPS, Caterpillar, which ended the day leading the industrials sector higher after the tariff report. Intermodal carrier JB Hunt may also boost trucking industry after their results confirmed Knight-Swift Transportation’s positive outlook given earlier in the day. Signet and jewelry names including Tiffany, after the former’s results sent shares tumbling to its lowest in nearly a decade Thursday. Tiffany is out now with fresh data on their holiday sales, citing strong sales growth in China (though lowered their range of views for EPS). Utilities as the PG&E Corporation saga continues and investors come to grips with the fact that its potential bankruptcy could tie the issue up in the courts for years. The stock completely reversed Thursday from the best to worst performer in the S&P 500 utilities sector, despite an activist push. The holiday-shortened week for Martin Luther King Jr. Day in the U.S. still ensures the earnings pace is maintained, with 59 of the S&P 500 members (with 6 Dow components) on tap. On the industrials and transportation side of the coin, we’ll see American Airlines attempt to replicate some of the success seen at United, which reported results that lifted the entire sector Wednesday, breaking an otherwise somber mood levied by Delta earlier in the week. Big rail also tries to get back on track after CSX’s results failed to impress, leaving Union Pacific and Norfolk Southern with the responsibility next Thursday to demonstrate any skills in precision scheduled railroading (PSR) and how that translates through to the bottom line. And WW Grainger will report, after its industrial peer Fastenal, which literally provides the nuts and bolts for industry, Thursday outperformed S&P 500 Industrials Index, lifting the segment. We’ll get a first look at real results from some of the semiconductor and capital equipment names, including IBM, Intel, Texas Instruments and Lam Research. Given that Intel is one of Lam’s largest customers (to the tune of 14% of revenue, according to data complied by Bloomberg), we may get early insight into the former’s results one day ahead with Lam’s. The above also derive large amounts of revenue from the Asia-Pacific region and are heavily reliant on a tariff/trade-related issues. Memory maker Western Digital gets an opportunity to prove Wells Fargo’s expectation they will cut guidance wrong. On the macro front, given the dearth of data emanating from the U.S. Government due to its shutdown, we’ll get PMI figures from China and the U.S., with a taste of the economic environment from the ECB in its latest rate decision. New Home sales data will also be key after homebuilders lagged the S&P for much of this week. JPMorgan is out with their views on household and personal care names, including an upgrade for Kimberly-Clark Corporation, the purveyor of diapers and tissues and other hygiene-related products. The rating goes to overweight, citing better cost savings for the company in light of subsiding inflationary pressures. Analyst Andrea Teixeira raised the price target to a Street-high $129, citing the ability for the company’s margins to inflect in 2019, partly due to price increases and cost savings.